Well, here we are, the Big Reveal of the finished Humber Keel gansey: washed and blocked, hopefully so that you can see the pattern in all its glory (and even modelled by a homeless derelict we found fighting seagulls for garbage down by the harbour, who was bribed with the promise of a rum-and-oven-cleaner cocktail). To recap: the bottom ribbing consisted of 388 stitches, increased to 432 for the body. The finished gansey measures 23 inches wide by 26 inches long (though it could easily be stretched wider – and longer – if required). The armhole is a little over 8 inches deep (consisting of 79 stitches), and the sleeve, including rolled-back cuffs, almost 22 inches long. It’s been fun, something I’ve never tried before. And have I been assiduously planning what to try next? Reader, I have not. Instead I’ve been enjoying a well-earned break, and actually doing some writing again: I’ve finally started a sequel to my Welsh winter fantasy novel, after all these years; my hope is to finish it by Christmas. And by next week I’ll be refreshed and ready to pick up a circular needle in anger again. Speaking of writers, I’ve been reading up on my Wick history and discovered that Robert Louis Stevenson (Treasure Island, Dr Jekyll, etc.) 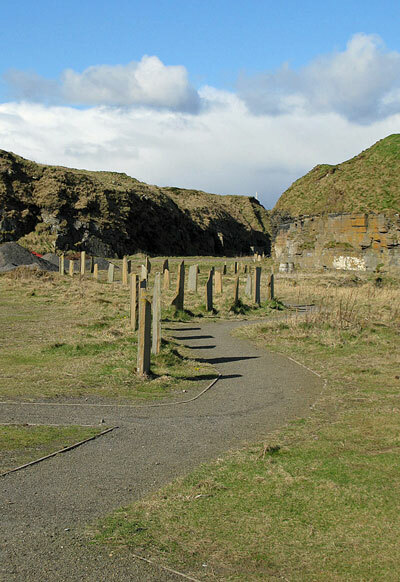 came to Wick in the 1860s when his father’s engineering company were contracted to build a breakwater in the harbour. Alas, the breakwater was destroyed in a series of unusually severe storms and had to be abandoned in 1873, though part of it remains, jutting out like a natural rock outcrop from the entrance to the south harbour, just past the old lifeboat station down by the cliffs). I think his first paragraph is a little harsh (even replacing the dissatisfied fish-curer with an archivist); but honesty compels me to admit the second is bang on the money even now, almost 150 years later… But I can’t complain; it’s perfect for wearing ganseys, after all. The gansey is lovely! The dangling triangles are quite nice!! It’s too bad we can’t see the model’s face! Dear Lynne and Song, thank you. Teddy bears and beaded socks sound fun, Lynne. I must admit, there are times when I wonder what it would be like to finish a project in under 6 months! It’a a beaut for sure….the idea of over 400 stitches per row overwhelms me. I did an estimate of how many stitches I had knit in a sweater once…oh my…best not to know. @ Gordon – I am still learning about all the patterns, so haven’t picked one yet for my project. Any suggestions? I do love cables…. You must show your ganseys on ravelry. as others have pointed out, I do tend to knit a bit tighter than most people – my stitch gauge hovers around 9 sts per inch, but many of the books with patterns go for around 8, and many of the old ganseys were knit to c. 7 sts per inch. So it’s up to you! I must admit, I’m a bit intimidated by Ravelry, as I am by most knitters. It’s a great site, I dip in and out occasionally, and the people are really friendly … but at the same time there are some people with very strong opinions about ganseys, people who are vastly more experienced knitters than I, and who have studied the subject closely. Whereas I just knit them, and I’ve developed my own techniques. You wouldn’t believe how long it took me to screw up my nerve to start this blog – and even now it only takes one stroppy email for my confidence to collapse like a dying star imploding! Such a well-dressed and stalwart “homeless derelict.” Never mind the opinionated knitters, I’d be surprised if they had knitted as many ganseys as you have. All it takes to have an opinion is a keyboard and a connection. 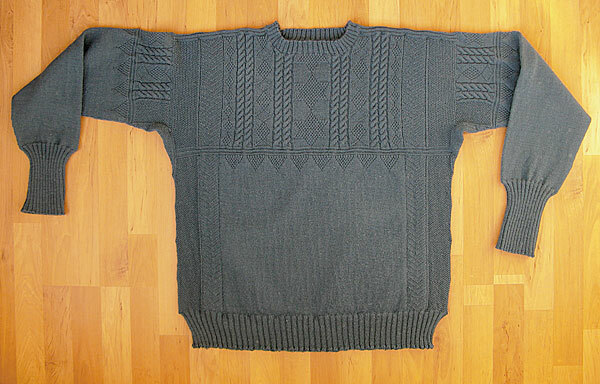 On ravelry you will also see “ugly” knitting and your ganseys are really good. Your own patterns, you can be proud on your ganseys. My english is to bad, i have not the good words to say it. Hello Gordon ! Congratulations to Humber. It´s interesting how the colour of it changed after washing 🙂 Is it blue, gray or green? The number of stitches is fantastic, I admire your patience and gauge. I never had more than 280 stitches in one row. Imagine, we still have snow – time for a new gansey? Hi again Judit. Snow?! Time for a gansey overcoat, I think. The colour is really grey-green (“conifer”) – the problem is that when we take a picture it’s very hard to get the colour right in the print, as it were (digital cameras, they’re rubbish). So it sometimes looks grey, sometimes light blue. But it’s always really green! Just let one stroppy email appear on this site and we will be all over them right gang. I for one love that you have this blog and I use your “how to” lots as I am knitting my first gansey ever. This is a great reference site and the humour is a bonus. I think you should design your own gansey from the welt up. Another blooming marvellous gansey, Gordon, and very different from the standard design on account of the pattern running up the sides as well. Wonderful! Given that the clocks go forward this weekend and I won’t be able to use the long dark winter evenings as an excuse not to start on the cones of dark navy gansey wool sitting reproachfully in the corner, I think that I’m just going to have to break out the fine pins and get going on the next one myself. But I am still tempted to order some cream wool from Frangipani and have a go at a Hebridean one too some time soon. I’m thinking mostly about a few years ago. I think that when you presume to have a website and tell people how to do things you set yourself up as an “expert”. Anyway, as I say, everyone I’ve interacted with on Ravelry has been very nice – I just don’t want to lift the stone in case something nasty comes out. Besides, I have freedom to edit posts on my blog! So for all anyone knows all my regular posters may really be figments of my imagination, created by me to make it look like people actually read the site. Or maybe they exist and I’m a puppet set up by a Svengali-like Margaret? Lisa – you think you have problems – I’ve just discovered it fits me perfectly and I’m going to have to give it away! Sue, it’s interesting you mention about the light. I’ve decided to arrange my schedule more sensibly. so I’m just about to start a darker gansey, and defer my cream gansey project to after this one, so I’m knitting a dark gansey in the summer and a light one in the winter. And yes, go for it. It would be rude not to! 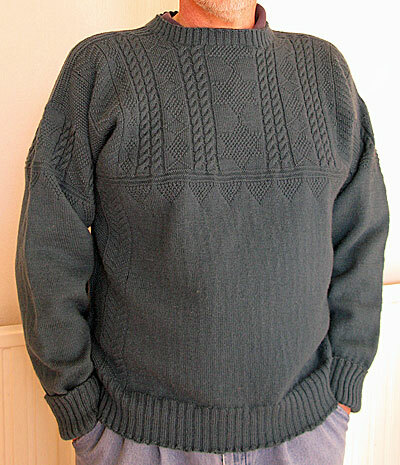 Gordon, having knitted the bro’s dark navy one in the dark afternoons and evenings of January and February last year, I vowed that I would never do the same again. I lost count of the number of times that settling down to an afternoon’s knitting in front of the fire started with ripping back a good few rows of the previous evening’s work because of mistakes that I didn’t notice until I was literally looking at it in the cold light of day. The zig-zags and later the chevrons were a particular trial to me! Sue, it’s good to know it’s not just me who has these troubles in winter! Richard Strauss wrote a bonkers opera called Die Frau Ohne Schatten, the Woman Without A Shadow. A vain and ambitious woman trades her shadow to a spirit in return for for riches and pleasure, but her shadow symbolises her fertility, and she won’t be able to have children (it’s a bit sexist, perhaps…). Anyway, at one point there’s an offstage chorus as she hears the voices of her unborn children pleading to be born. It’s a haunting moment, beautifully composed. But I wonder if when I stop knitting ganseys because of my eyesight, if I’ll be haunted like her by all the ganseys i never brought into being?! I’m already looking forward to hearing about your plans for your next gansey ‘baby’. Hello again, Sue. Alas, I regret to inform you that given the chance I would sell out like a shot – well, maybe not my shadow, or anything really important, but if I had any artistic integrity I’m not sure it would survive for long!